Newage Hardness files are Yamamoto types, used to measure the resistance of solid surfaces to permanent deformation by a hardness file. The file has a single point (stylus tip). This test method is intended to measure the resistance of solid surfaces to permanent deformation under the action of a single point (stylus tip). It is a companion method to quasi-static hardness tests in which a stylus is pressed into a surface under a certain normal load and the resultant depth or impression size is used to compute a hardness number. Scratch hardness numbers, unlike quasi-static hardness numbers, involve a different combination of properties of the surface because the indenter, in this case a diamond stylus, moves tangentially along the surface. Therefore, the stress state under the scratching stylus differs from that produced under a quasi-static indenter. Scratch hardness numbers are in principle a more appropriate measure of the damage resistance of a material to surface damage processes like two-body abrasion than are quasi-static hardness numbers. This test method is applicable to a wide range of materials. These include metals, alloys, and some polymers. The main criteria are that the scratching process produces a measurable scratch in the surface being tested without causing catastrophic fracture, spallation, or extensive delamination of surface material. Severe damage to the test surface, such that the scratch width is not clearly identifiable or that the edges of the scratch are chipped or distorted, invalidates the use of this test method to determine a scratch hardness number. Since the degree and type of surface damage in a material may vary with applied load, the applicability of this test to certain classes of materials may be limited by the maximum load at which valid scratch width measurements can be made. 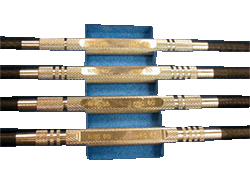 Click on the menu below to see the full range of hardness files. Hardness Files, HRC, 20, 30, 40, 50, 55, 60, 65 and 67. Hardness Files, HV, 200, 300, 400, 500, 600, 700, 800, 900. Spare Shank, please specify HRC or HV.